Today we continue with the second in a series of articles about the bipolar transistor. The first section is here. 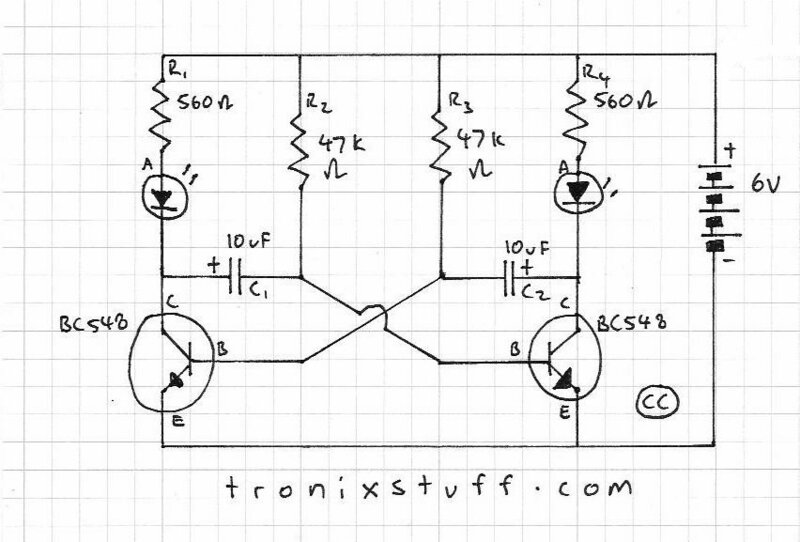 In this article we look at using the bipolar transistor as an amplifier. 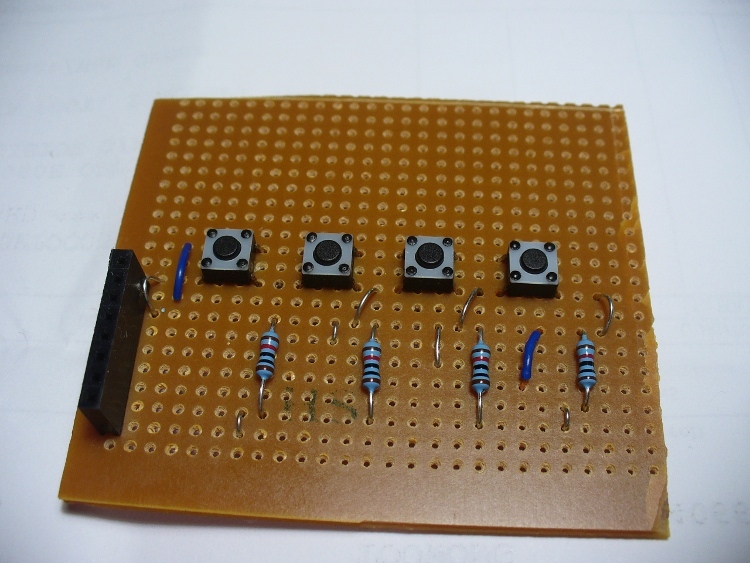 That is, change a very small alternating-current signal and make it larger, increasing the amplitude of the signal. Although originally it would seem to be rather simple, perhaps it is not. 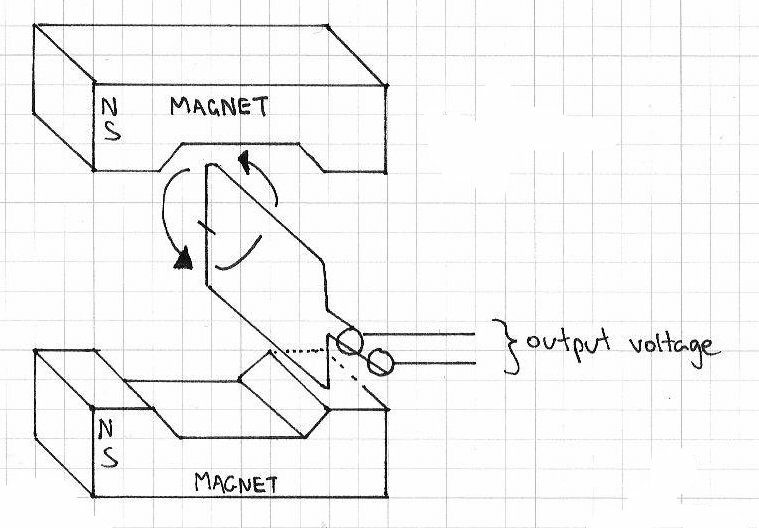 There are many, many ways to construct a transistor amplifier circuit, but I hope this introduction helps your basic understanding of the process. 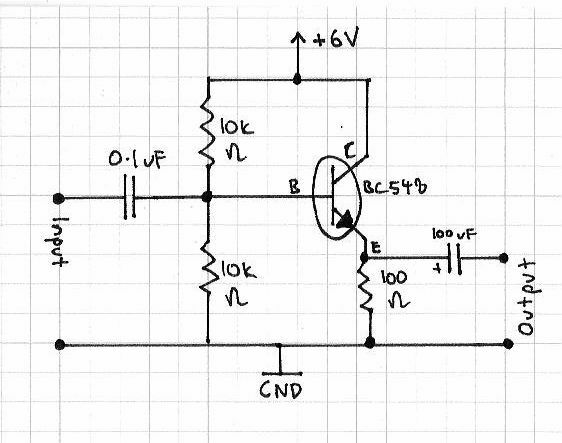 When selecting transistors one needs to take note of the hFE (DC current gain), as variations in this will require a complete recalculation of the values for the bias resistors. Even a common model such as the BC548 is available with hFE ranges between 110~520. 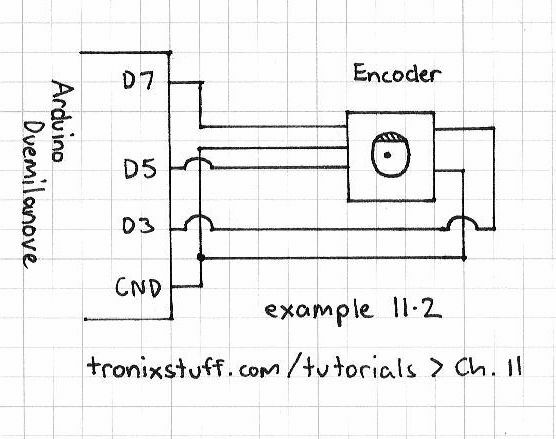 Consider the example schematic above. The transistor is not saturated, due to the bias being set by the two 10k ohm resistors, which drops the voltage over the base by around half. 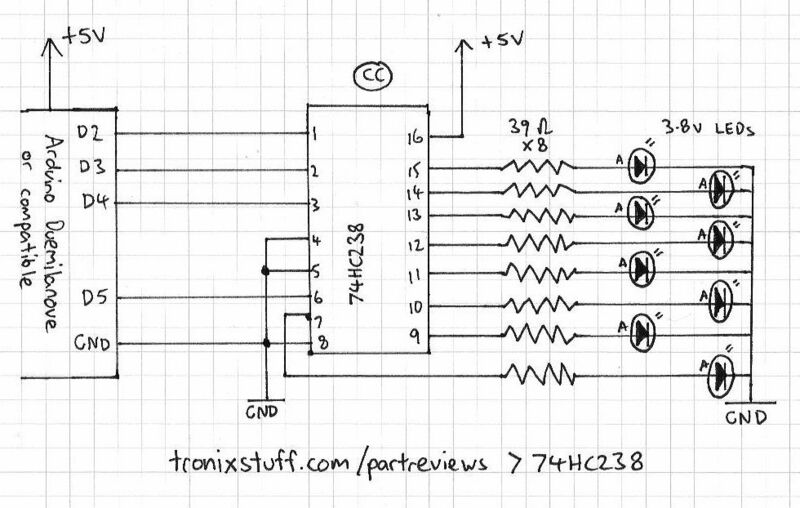 In this case with our 6V supply this drops to around 3V. When power is applied, the transistor is biased and allows a small amount of current to flow, but it still has a lot more current-handling capacity. 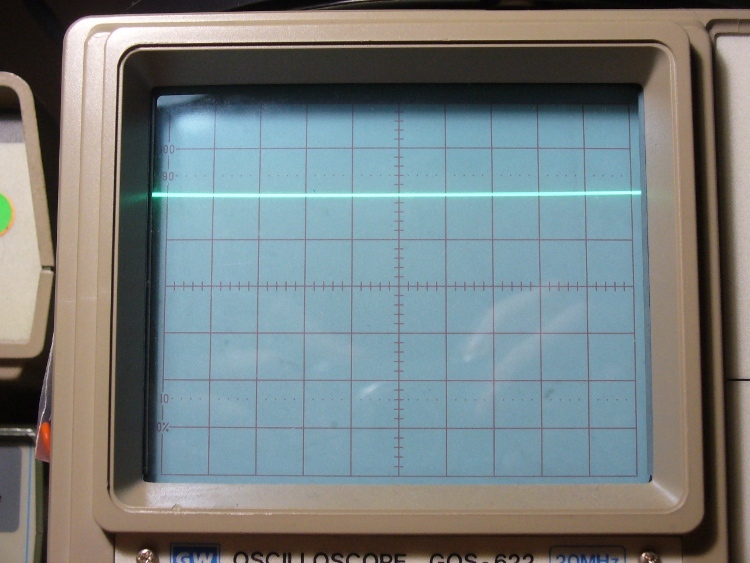 In testing this example, without an input the base current Ib is 0.32 milliamps, and the collector current Ic is 19.9 milliamps . These amounts of current are known as the quiescent current values. At the end stage of the video clip we increased the input signal greatly. Did you notice the clipping at the output? This occurs when the voltage is too great for the transistor, and therefore it cannot pass the complete signal through to the emitter. In an audio signal situation, this will cause distortion. That is another reason to check the specification of the transistor against your requirements. The left half of the circuit above should be familiar. The 10uF capacitor at the bottom is to stop the DC current being passed through to the base of the BC548 transistor. 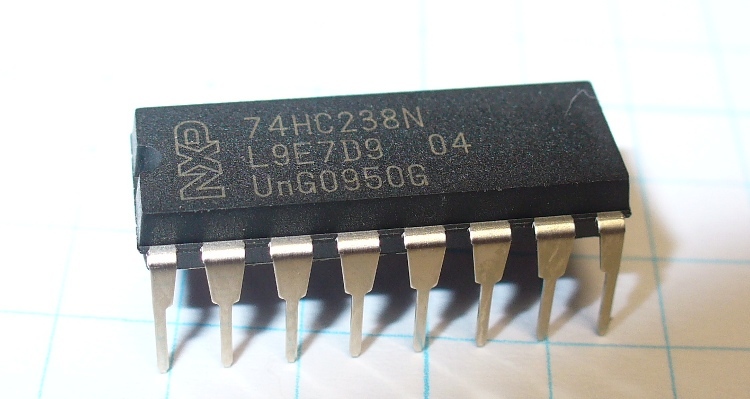 The second transistor, the BC558 is a PNP transistor, and amplifies the signal at the collector of the BC548. 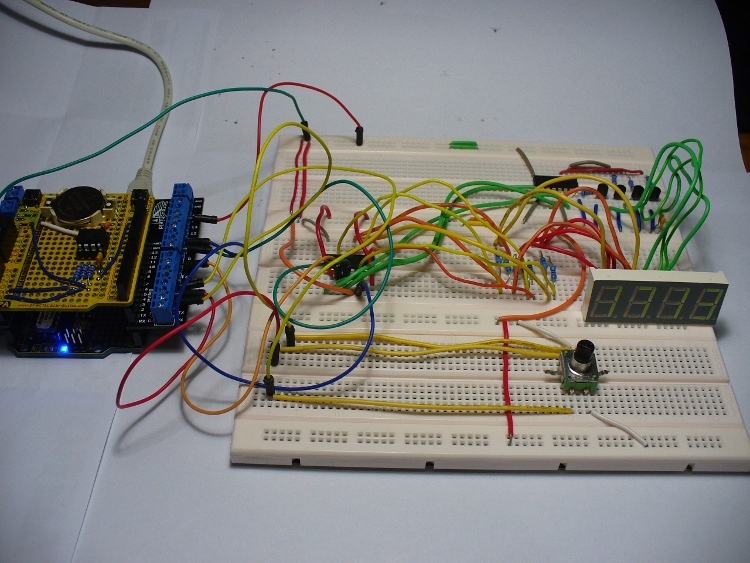 Finally, the 1uF capacitor blocks the DC current from reaching the output. However in using two or more transistors in such a method, you need to ensure the emitter current rating of the second transistor is much higher, as the gain of two transistors is the product of the individual transistors’ gain. 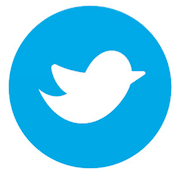 Question – Who makes the BC547 transistors sold by Little Bird Electronics? As stated at the beginning, this is only an introduction. There are literally hundreds of thousands of pages of material written about the use of transistors, so don’t stop here – experiment and do your own research and learning! Today we are going to continue exploring alternating current, with regards to how resistors and capacitors deal with AC. This chapter is part two, chapter one is here. 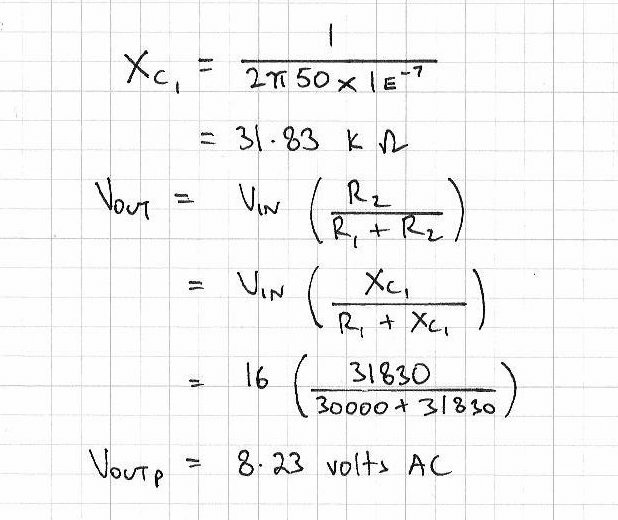 That is, note that there are three possible voltage values, Vpp, Vp and Vrms. Moving on. Alternating current flows through various components just like direct current. Let’s examine some components and see. First, the resistor. 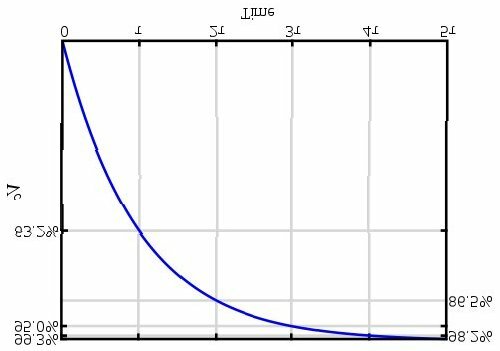 It operates in the same way with AC as it does DC, and the usual calculations apply with regards to Ohm’s law, dividing voltage and so on. 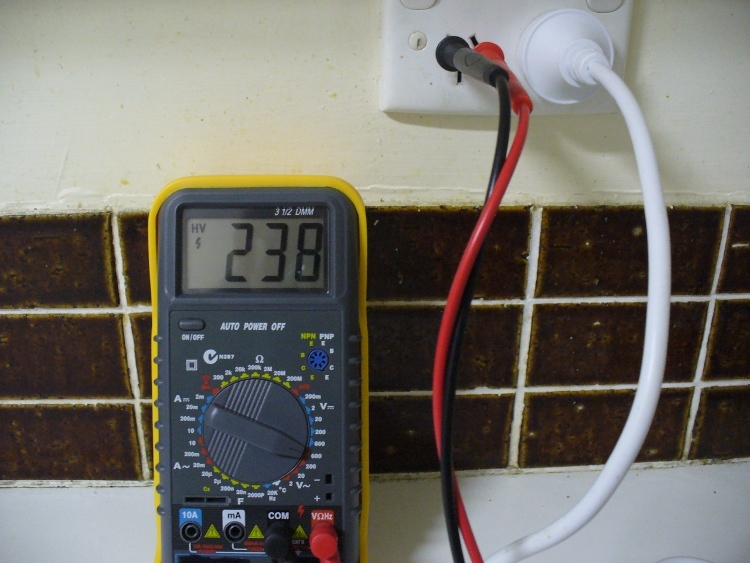 However you must keep in mind the type of voltage value. For example, 10Vrms + 20Vpp does NOT equal 30 of anything. But we can work it out. 20Vpp is 10Vp, which is 7.07Vrms… plus 10Vrms = 17.07Vrms. Therefore, 10Vrms + 20Vpp = 17.07Vrms. Also consider if you have identical frequencies, a smaller capacitor will offer a higher resistance than a larger capacitor. Why is this so? 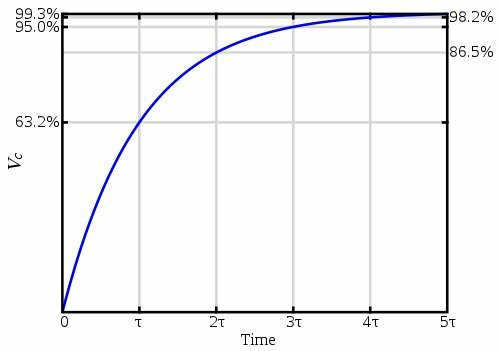 A smaller capacitor will reach the peak voltages quicker as it charges in less time (as it has less capacitance); wheras a larger capacitor will take longer to charge and reach the peak voltage, therefore slowing down the current flow which in turn offers a higher reactance. Please note that my CRO is not in the best condition. In the clip it was set to a time base of 2 milliseconds/division horizontal and 5 volts/division vertical. Thus ends chapter two of our introduction to alternating current. I hope you understood and can apply what we have discussed today. As always, thank you for reading and I look forward to your comments and so on. 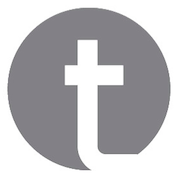 Furthermore, don’t be shy in pointing out errors or places that could use improvement, you can either leave a comment below or email me – john at tronixstuff dot com. 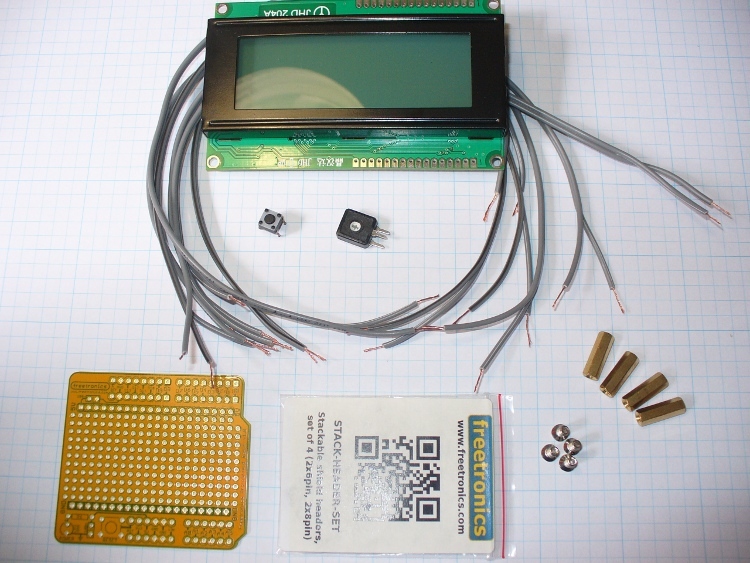 What we have: one 20×4 character backlit LCD, a Freetronics basic protoshield, some stacking pin headers, a button, 10k ohm trimpot for contrast adjustment, and some spacers and matching screws to give the LCD some legs. Afterwards I got some 0.1uF ceramic capacitors as well, to smooth supply current on the 5V rail of the shield. 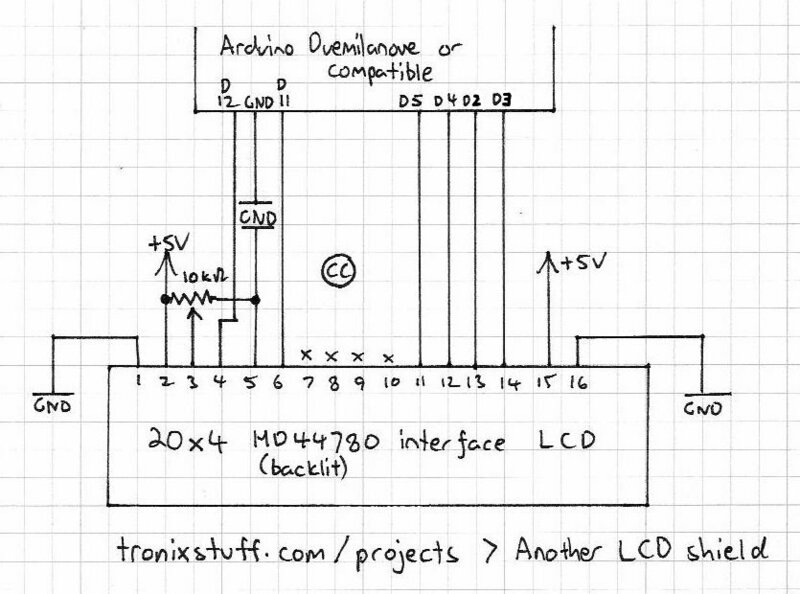 Here is the data sheet for the LCD: 2004 LCD.pdf. 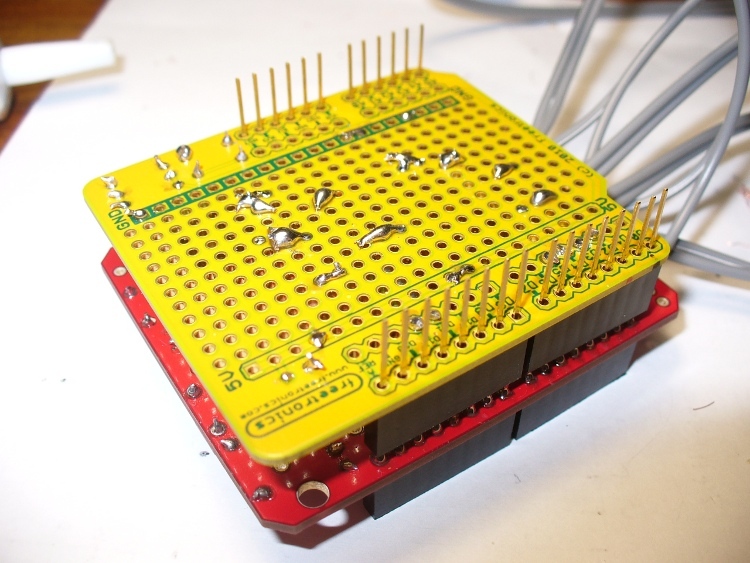 Now it was time to finish the soldering work. 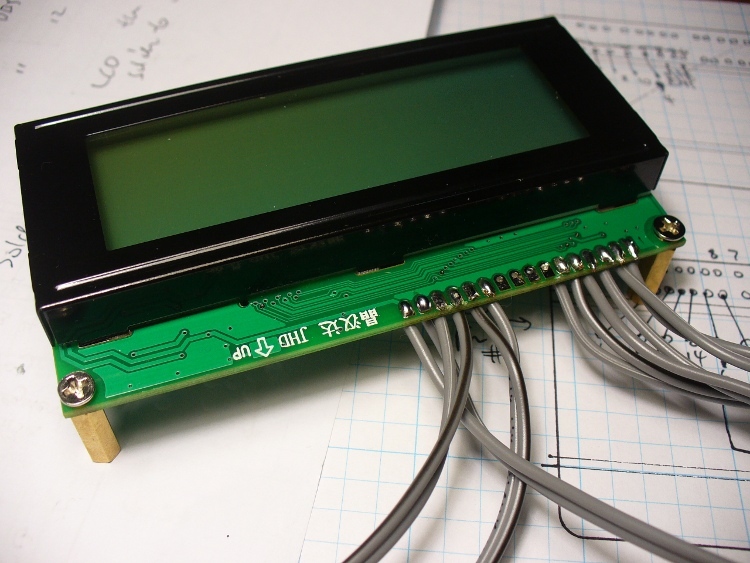 Instead of trying to jam all the wires together along the digital pins, I used some wire jumpers to spread out the landing points for the wires from the LCD. 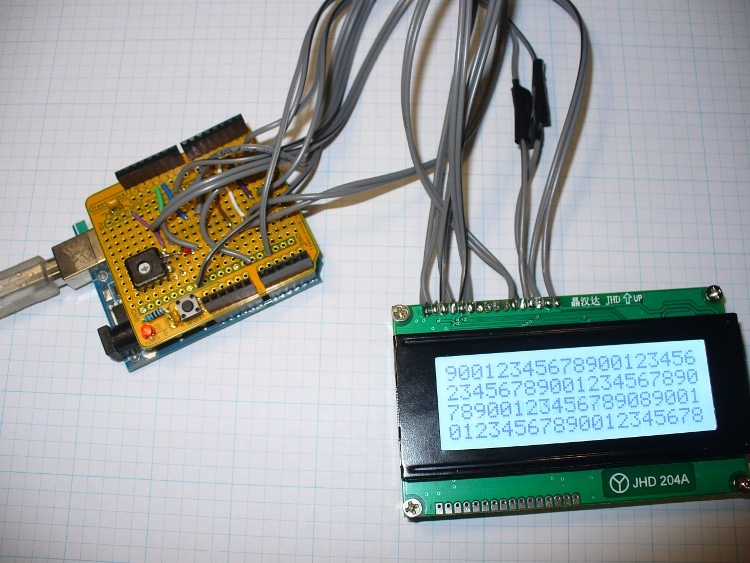 After soldering in the pins, the first attempt of using the display was unsuccessful. 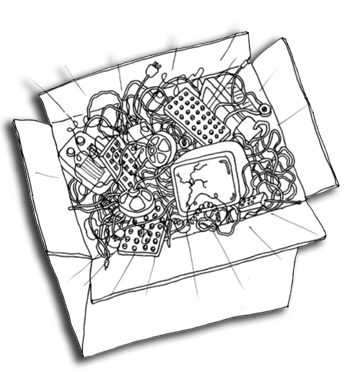 I had confused a couple of wires, but some reprogramming of the sketch fixed that. (It was Saturday night and my eyes were tired). But once the error had been fixed – success! 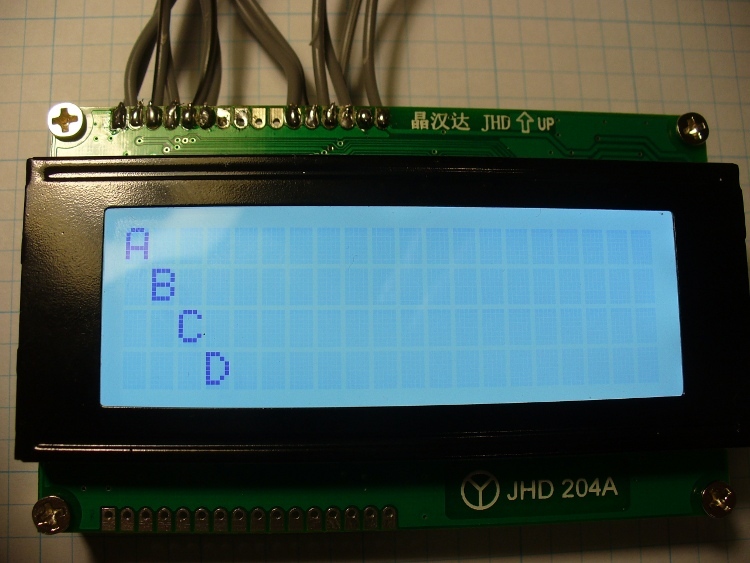 Question – from which organisation did my LCD module come from? So there you have it. 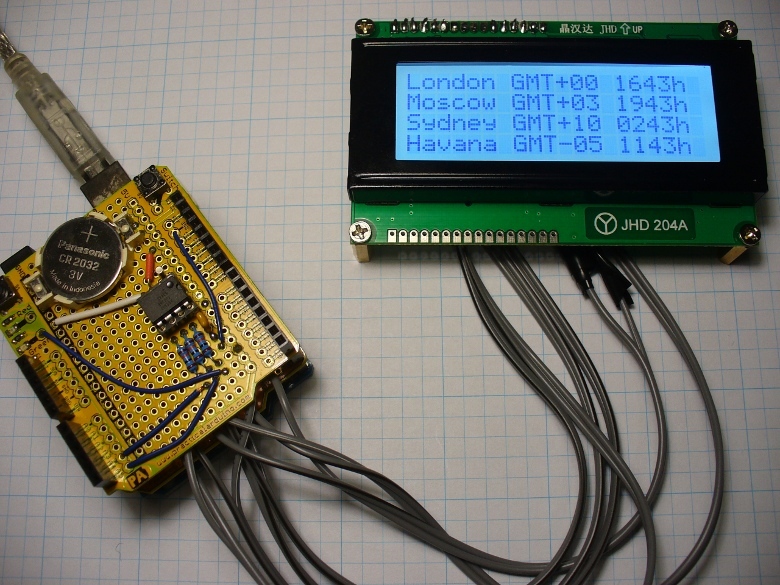 Another way to use an LCD with an Arduino, and show how you can do things yourself. If you have any questions at all please leave a comment (below). 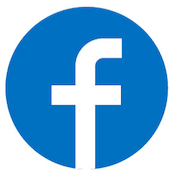 We also have a Google Group dedicated to the projects and related items on the website – please sign up, it’s free and we can all learn something. High resolution photos are available from flickr. This article is a guide – always check your own work before committing to construction. Otherwise, have fun, stay safe, be good to each other – and make something! 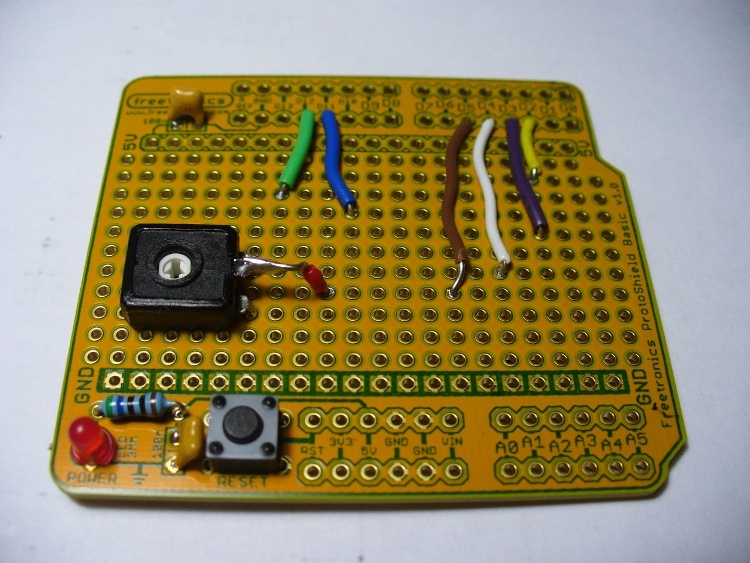 Today we are going to examine the 4541 CMOS programmable timer IC. 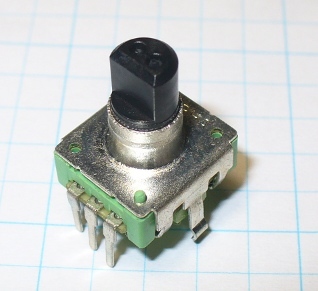 The main function of this chip is to act as a monostable timer. 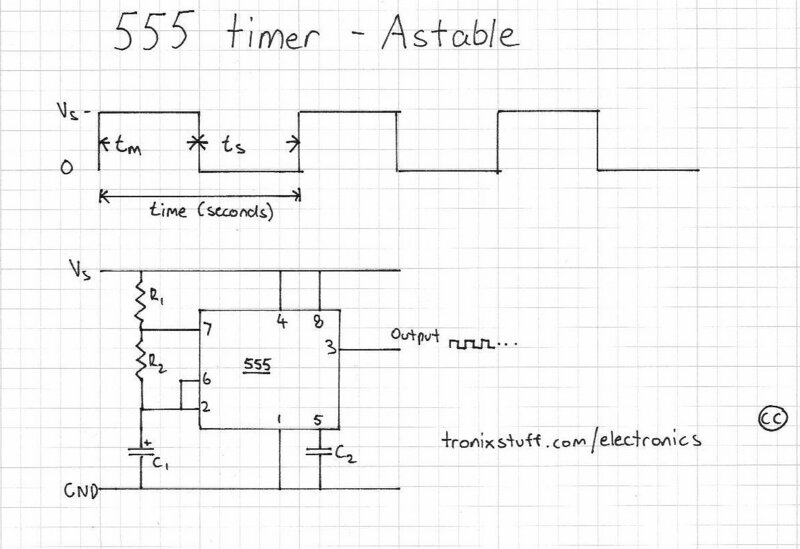 You are probably thinking one of two things – “what is a monostable timer?” or “why didn’t he use a 555 timer instead?”. 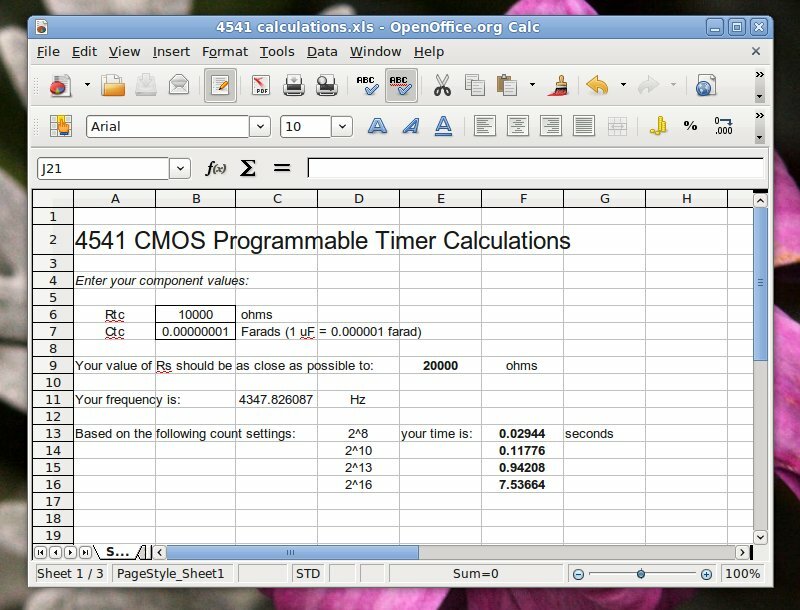 A monostable timer is a timer that once activated sets an output high for a specified period of time, then stops waiting to be told to start again. If you are not up to speed on the 555, have a look at my extensive review. As you can see this is a 14-pin package by Texas Instruments. It is also available in various surface-mount options. 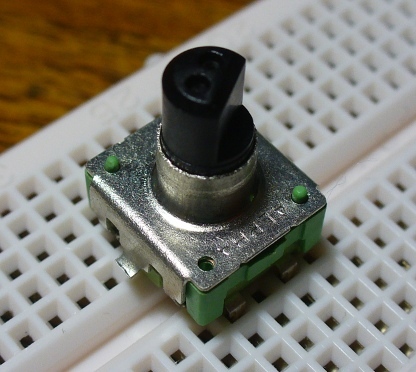 It is also currently available from Fairchild, NXP, ON Semi, and ST Micro. Note that this is a CMOS semiconductor, and that you should practice good anti-static precautions when handling it. 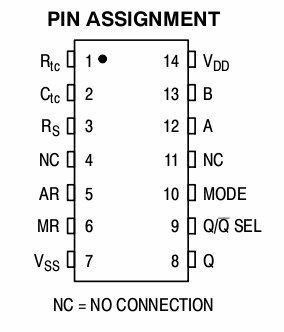 Futhermore, when designing it into your circuit, don’t leave any pins floating – that is not connected to +5V or ground; unless specified by the data sheet. Here is the data sheet from ON Semiconductor. There are two external resistors used in the circuit – Rtc and Rs. Rs needs to be as close as possible to twice the value of Rtc. Try and use 1% tolerance metal-film resistors for accuracy, and a small value capacitor. Also remember to take note of the restrictions printed next to the formula above. 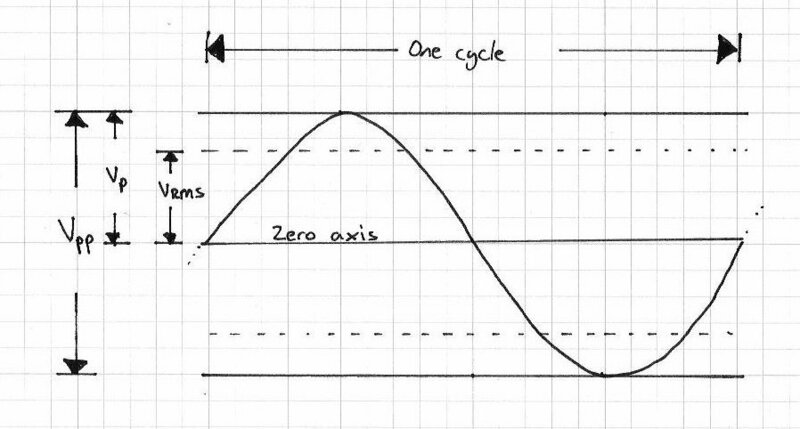 Before examining a demonstration circuit, I would like to show you how to calculate your timing duration. As you can see from the formula above, calculating the frequency is easy enough. 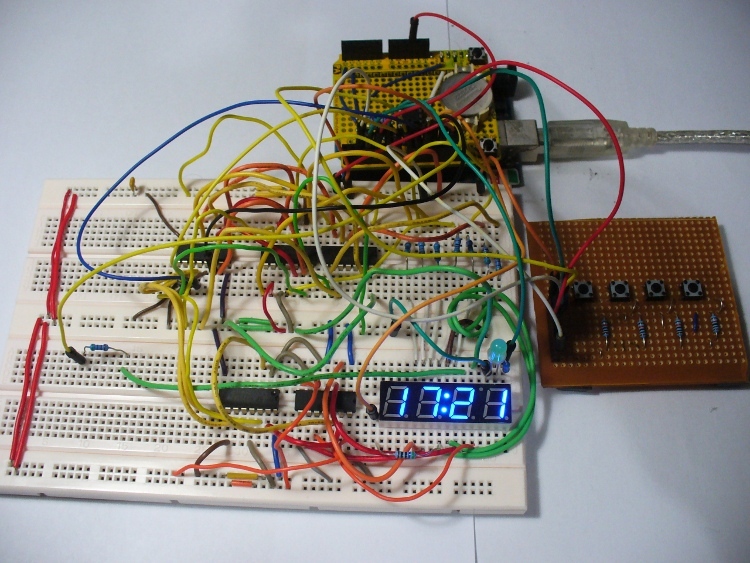 Once you have a value for f, (the number of counts per second) divide this into the count value less one power you have wired the chip. 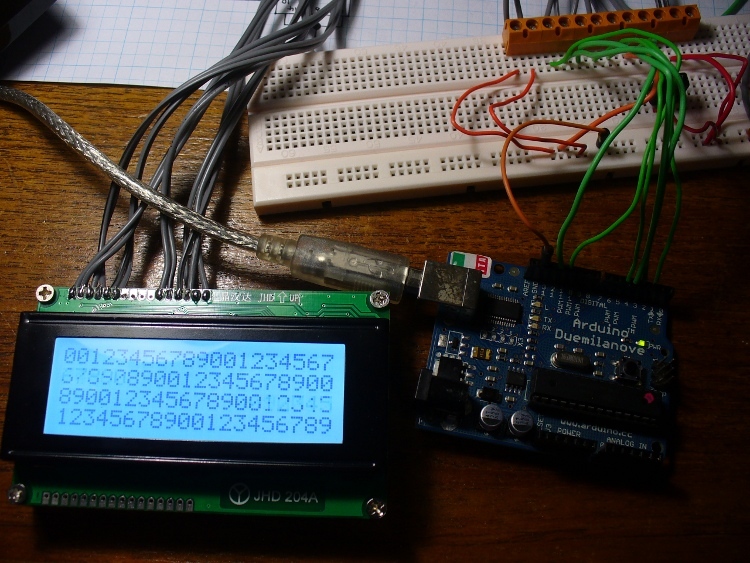 That is, if you have wired the chip up for 2^16, divide your frequency into 2^15. 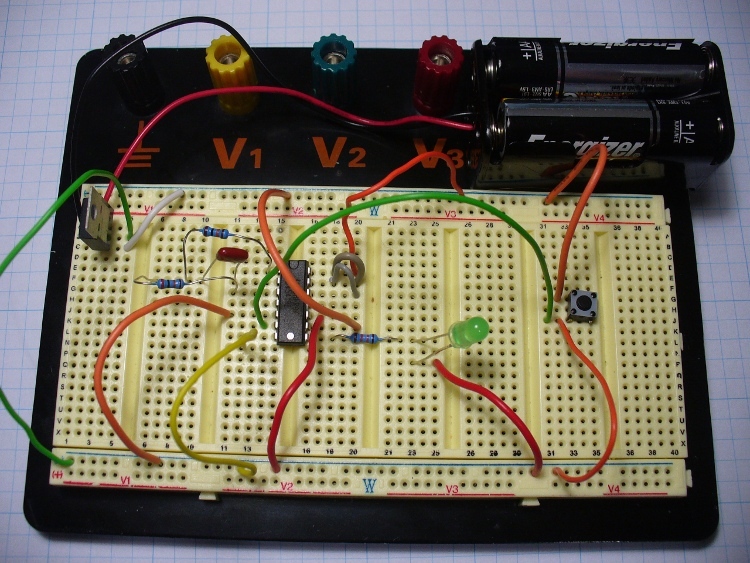 Here is my demonstration monstable circuit. Once the power has been turned on the counter starts, and once finished the LED is lit. Or if the circuit already has power, the reset button SW1 is pressed to start counting. 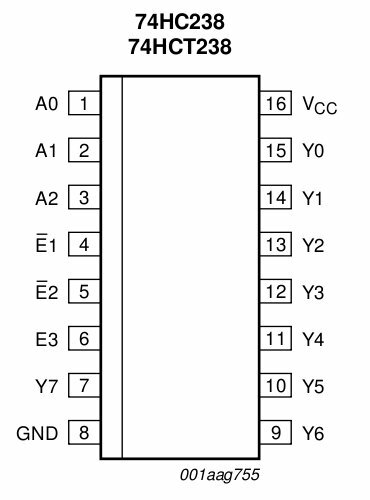 You can see that pins 12 and 13 are high to enable counting to 2^16; pin 6 is low unless the button is pressed; and pin 9 is low which keeps the LED off while counting. Easily done. 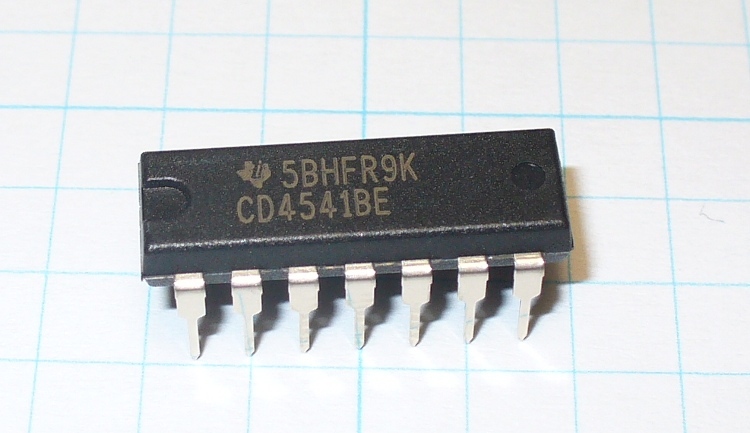 Although this IC has been around for a long time, and many other products have superseded it, the 4541 can still be quite useful. 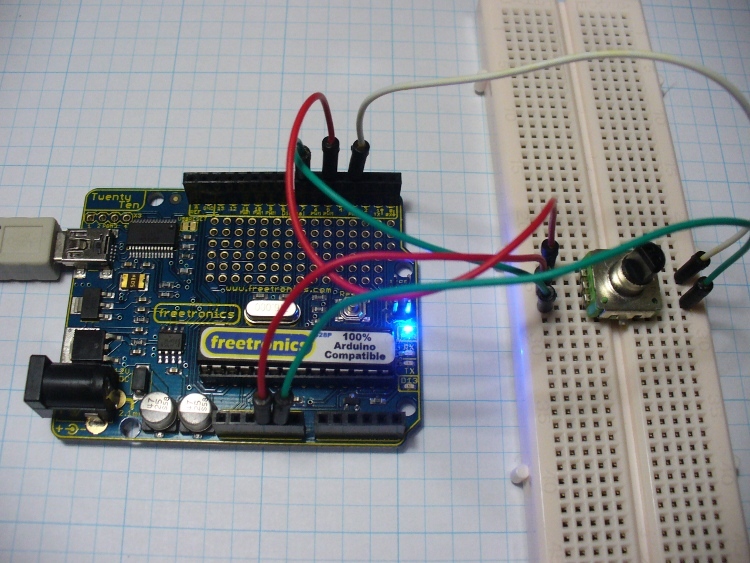 For example, an Arduino system might need to trigger a motor, light, or something to runfor a period of time whilst doing something else. Unfortunately (thankfully?) 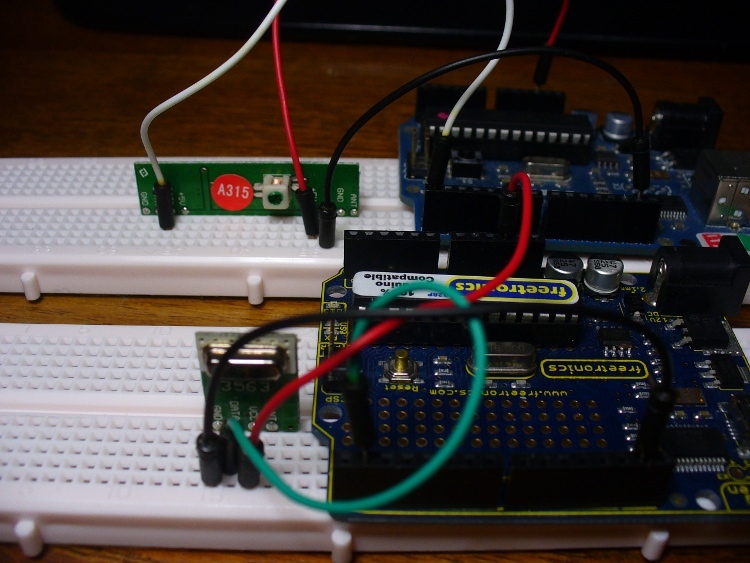 Arduino cannot multi-task sketches, so this is where the 4541 can be useful. 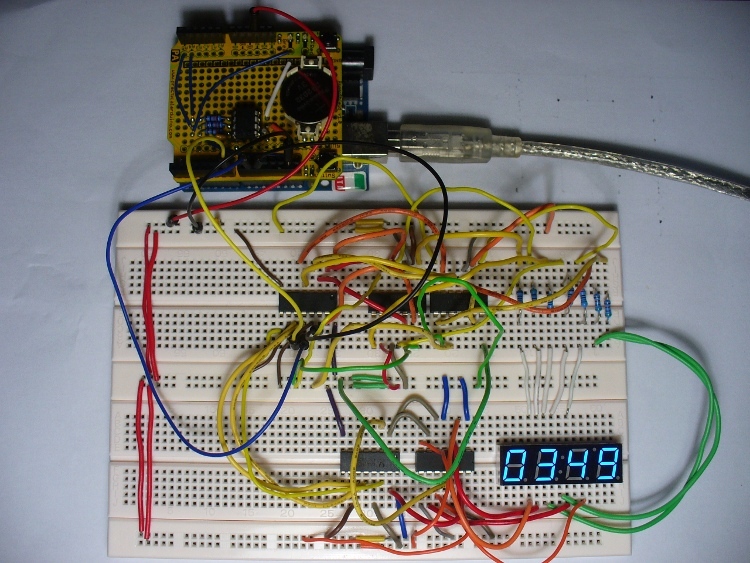 You only need to use a digitalWrite() to send a pulse to pin 6 of your timer circuit, and then the sketch can carry on, while the timer does its job and turns something on or off for a specified period of time. Well I hope you found this part review interesting, and helped you think of something new to make. 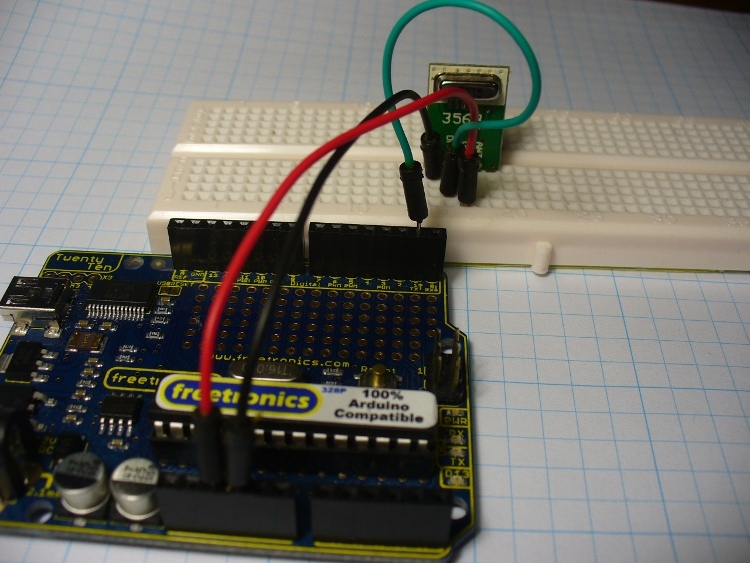 Notes: In writing this post, I used information from NXP and On Semiconductor. Thank you. 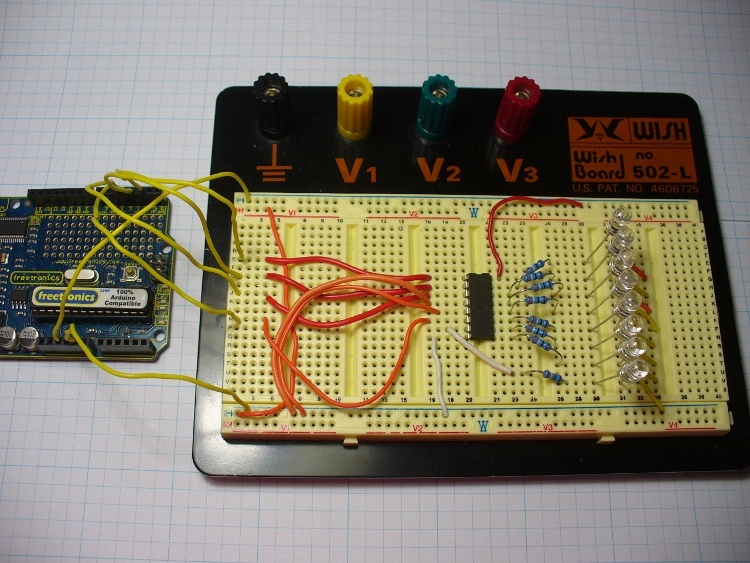 Today we continue with the series of articles on basic electronics with this continuation of the article about the resistor. Part one can be found here. 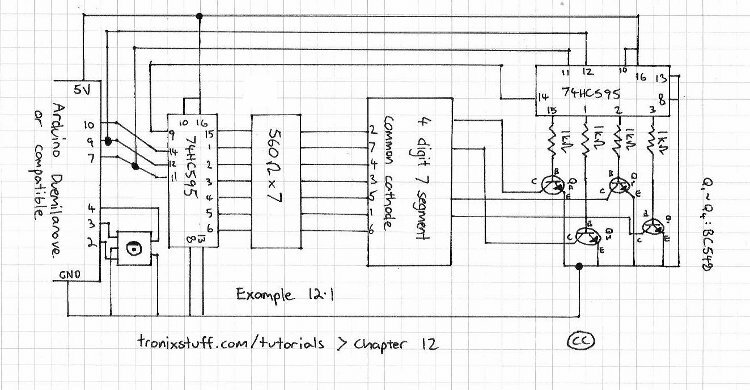 In this chapter we will examine how two or more resistors alter the flow of current in various ways. First of all, let’s recap what we learned in the previous chapter. 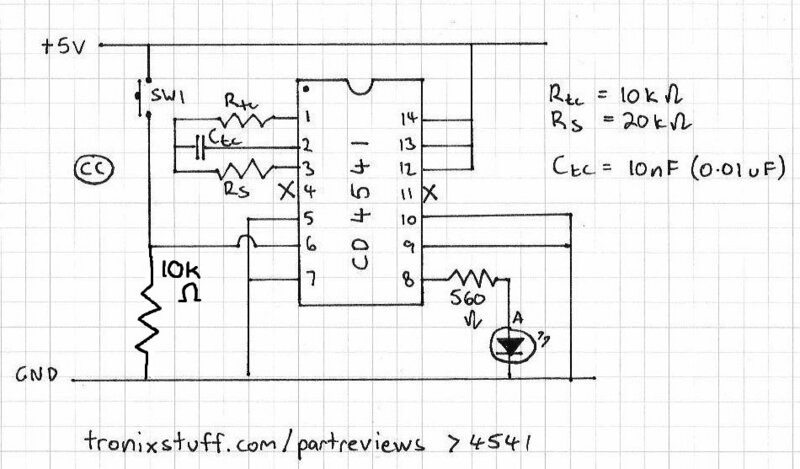 There is a balance between the two resistors with regards to the amount of current each can handle. 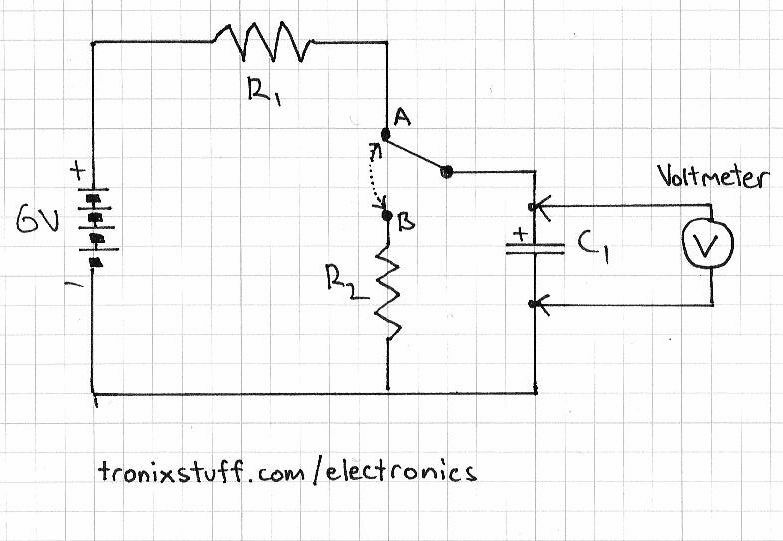 The sum of the current through both resistors is the total current flowing through the circuit (It). The greater the resistance the less current will flow, and vice versa. That is, they are inversely proportional. And if R1 = R2, I1 = I2. Therefore, I1/I2=R2/R1 – or you can re-arrange the formula to find the other variables. 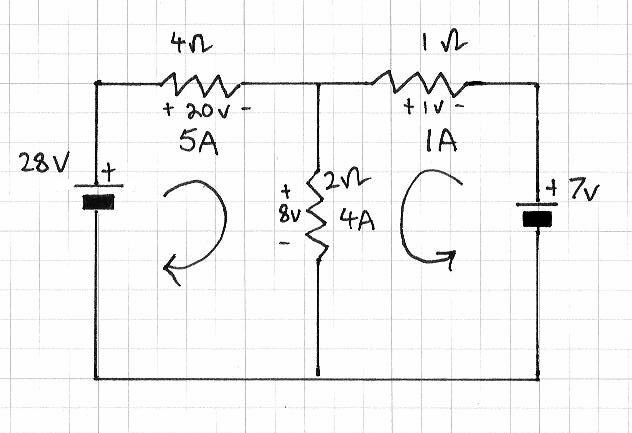 Our problem here – there is 6 volts DC at half an amp running from left to right, and we want to use an indicator LED in line with the current. 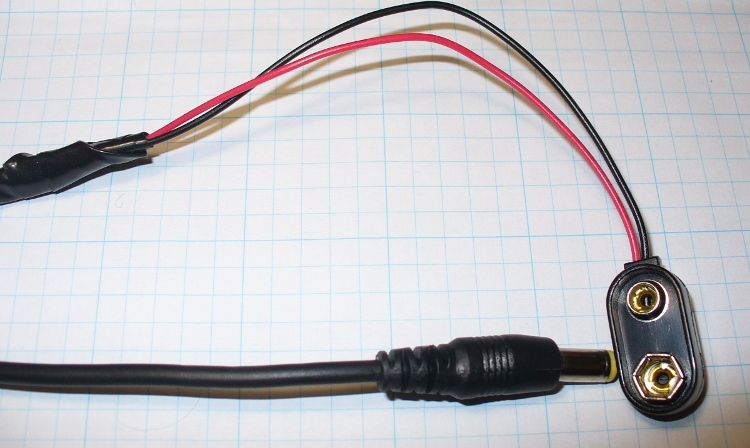 However the LED only needs 2 volts at 20mA. 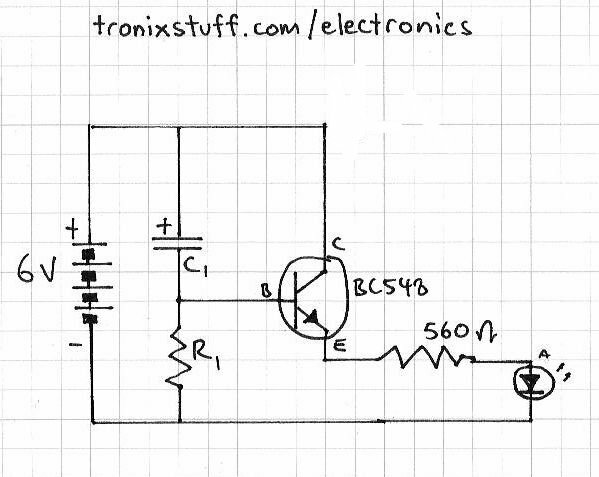 What value should the resistors be? First of all, let’s look at R1. 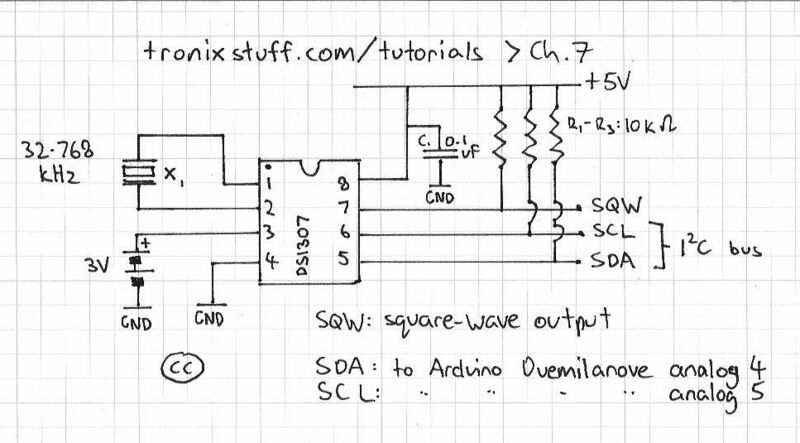 It needs to change 6V to 2V, and only allow 20 mA to pass. R=E/A or R= 4 volts /0.2 amps = 200 ohms. So R1 is 200 ohms. I1 is .02 A. Now we know that the total current is equal to I1+I2, so I2 will be 0.48A. That leaves us with the known unknown R2 We can re-arrange the formula R2/R1=I1/I2 to get R2 = (R1 x I1)/I2 – which gives us R2 of 8.3 ohms. 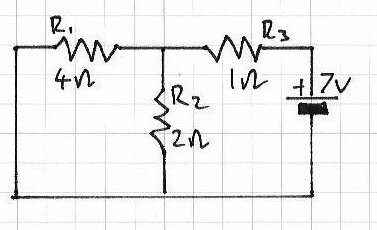 Naturally this is a hypothetical, but I hope you now understand the relationship between the current through the resistors, and their actual resistance. 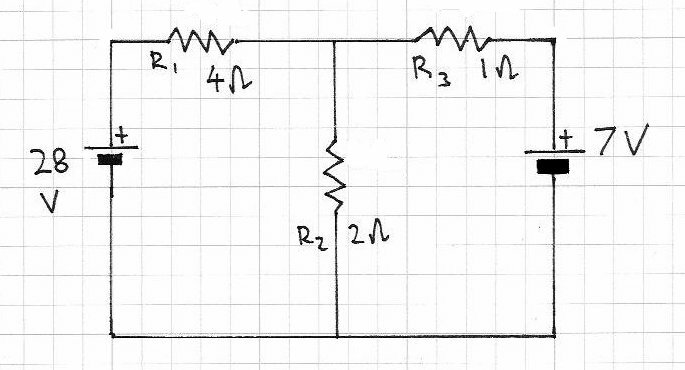 What we have just demonstrated in the problem above is an example of Kirchhoff’s current law (KCL). Gustav Kirchhoff was another amazing German physicist who worked on the understandings of electrical circuits amongst other things. More on GK here. His current law states that the amount of current entering a junction in a circuit must be equal to the sum of the currents leaving that junction. And not-coincidentally, there is also Kirchhoff’s voltage law (KVL) – the amount of voltage supplied to a circuit must equal the sum of the voltage drops in the circuit. These two laws also confirm one of the basic rules of physics – energy can not be created nor destroyed, only changed into different forms. So with some basic algebra you can determine various unknowns. If algebra is your unknown, here is a page of links to free mathematics books, or have a poke around BetterWorldBooks. 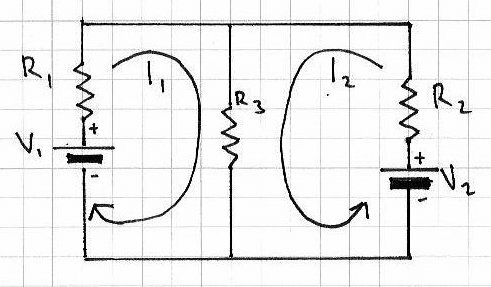 There is also another way of finding the currents and voltages in a circuit with two or more sources of supply – the Superposition Theorem. 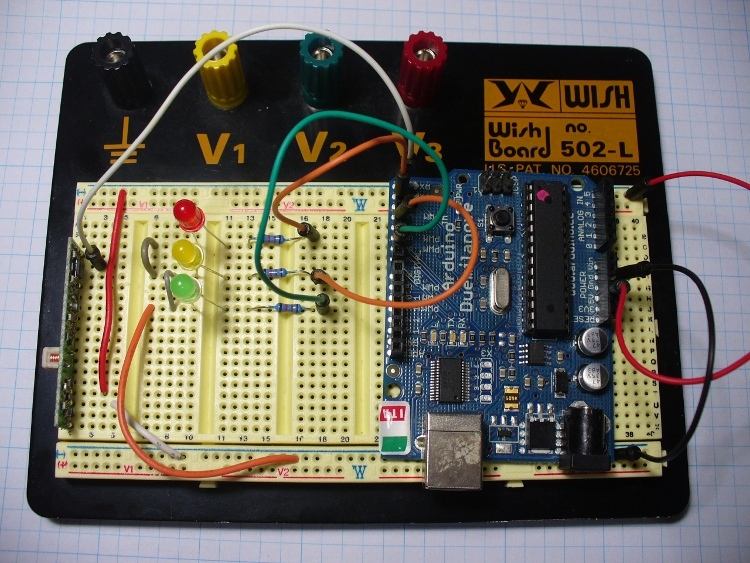 This involves removing all the sources of power (except for one) at a time, then using the rules of series and parallel resistors to calculate the current and voltage drops across the other components in the circuit. Then once you have all the values calculated with respect to each power source, you superimpose them (by adding them together algebraically) to find the voltages and currents when all the power sources are active. It sounds complex, but when you follow this example below, you will find it is quite simple. And a lot easier the th.. fourth time. Just be methodical and take care with your notes and calculations. So let’s go! Which gives us a value of 6 amps for It. 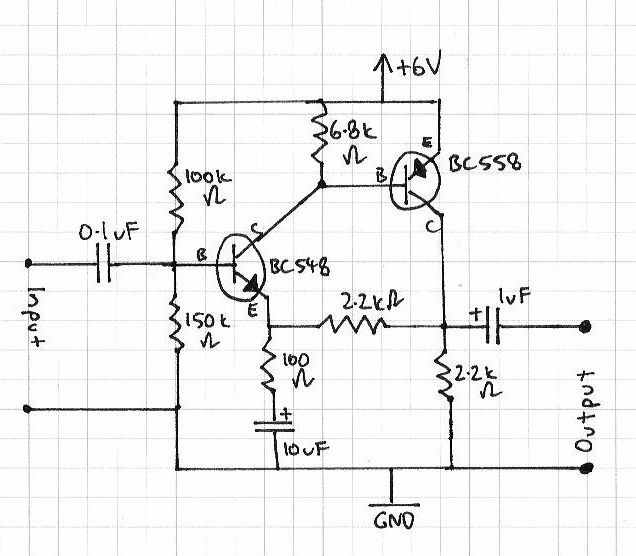 This current flows through R1, so the current for R1 is also 6 amps. 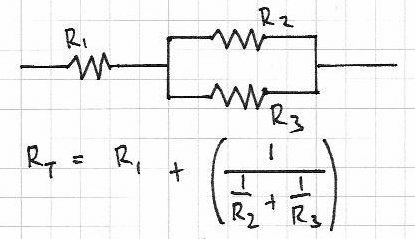 Using Kirchhoff’s Current Law, the current flowing through R2 and R2 will equal It. So, this is 4 amps. 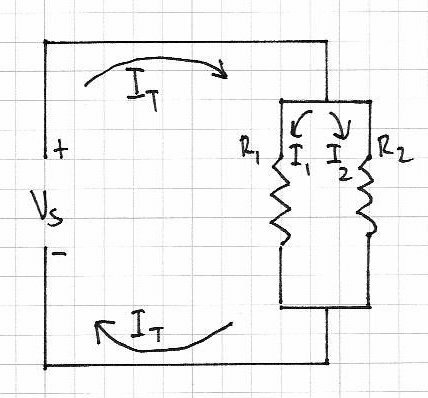 For source voltage 28V, Ir1 = 6A, Ir2 = 2A and Ir3 = 4A; R1=4 ohms, R2 = 2 ohms, R3 = 1 ohm. So Ir2 = 2A – therefore using KCL Ir1 = 3-2 = 1A. So, with 7V source: Ir1 = 1A, Ir2 = 2A and Ir3 = 3A. 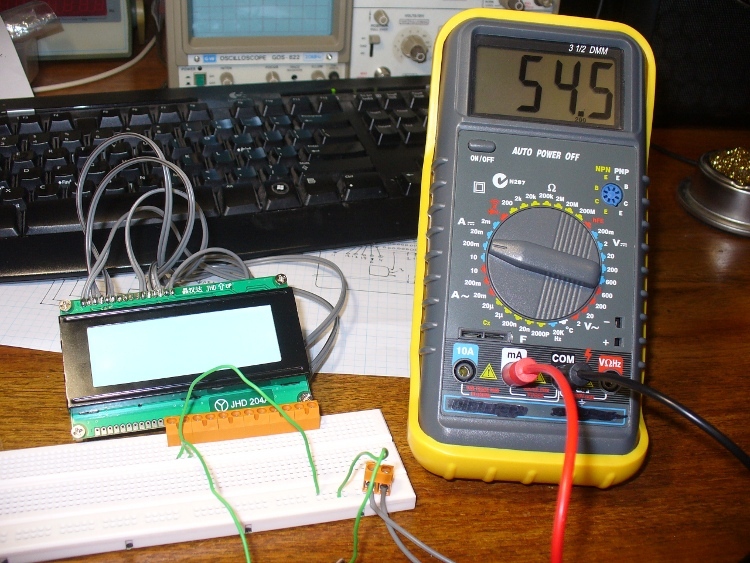 Next, we calculate the voltage drop across each resistor, again by using only one voltage source at a time. 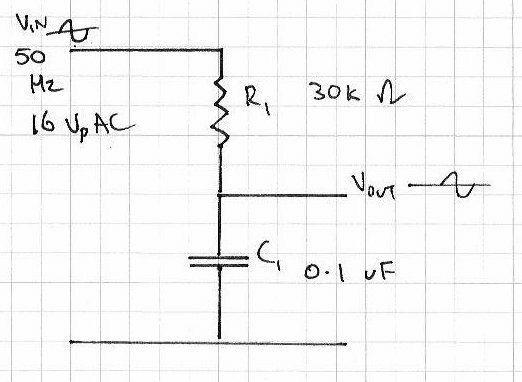 Using Ohm’s law, voltage = current x resistance. Vr1 = 4 x 6 = 24V; Vr2 = 2 x 2 = 4V; Vr3 = 4 x 1 = 4V. 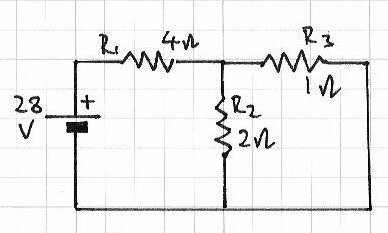 Recall that R2 and R3 are in parallel, so the total voltage drop (24 + 4V) = 28 V which is the supply voltage. Vr1 = 4V, Vr2 = 4V, Vr3 = 3V. Voltage – Vr1 = 24 – 4 = 20V; Vr2 = 4 + 4 = 8V; Vr3 = 4 – 3 = 1V. you cannot calculate power (watts) with this theorem, as it is non-linear. Well that is enough for today. I hope you understood and can apply what we have discussed today. 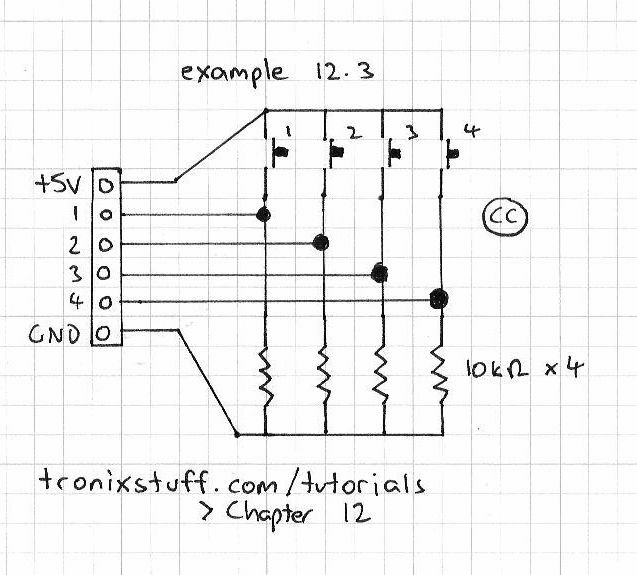 The final chapter on resistors can be found here. 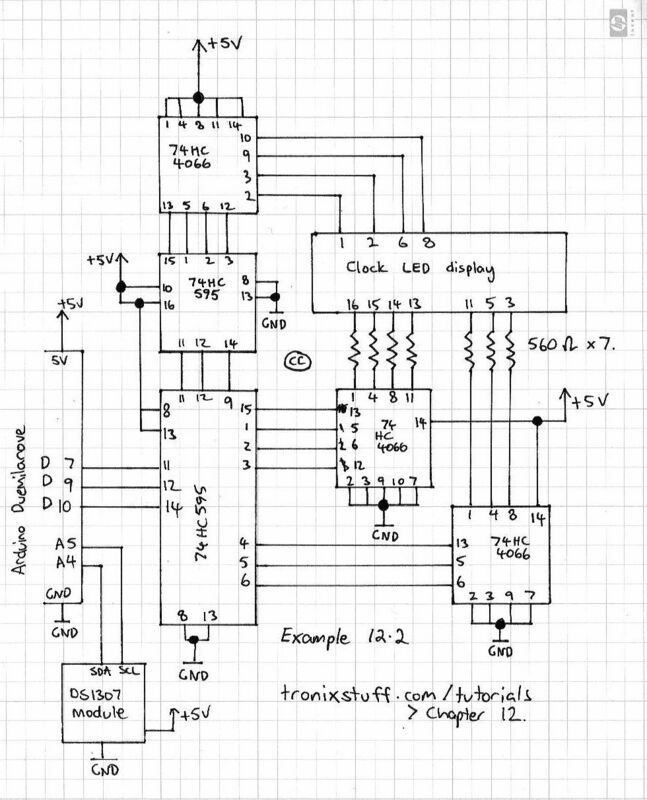 Notes: In writing this post, I used information from allaboutcircuits.com, plus information from various books by Forrest Mims III and “Practical Electronics Handbook” 4th ed., Ian Sinclair. And used a lot of paper working out the theorem for myself. Thank you! You are currently browsing the archives for the electronics tutorial category.